Initiative 1639, a voter-approved package of new state gun control laws, has created a political firestorm across Washington, with over a dozen sheriffs publicly stating that they won't enforce the measure on the grounds that it's unconstitutional. 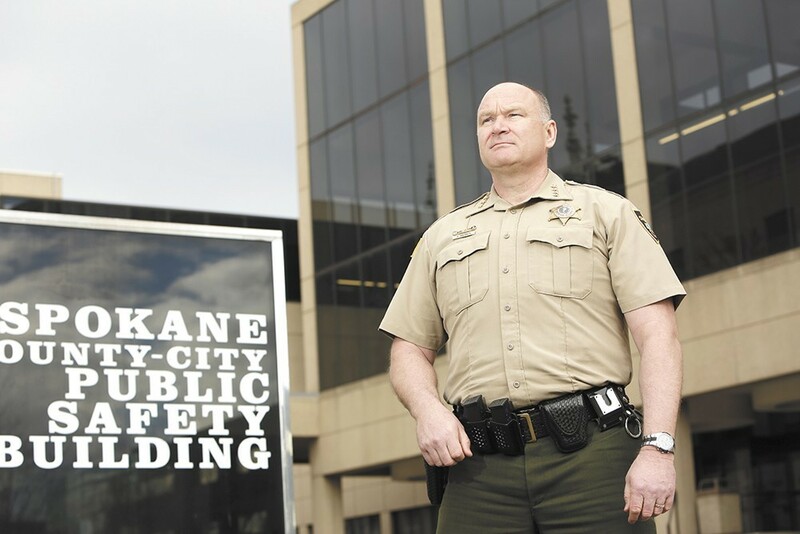 But Spokane County Sheriff Ozzie Knezovich, who also opposes I-1639, has repeatedly called out his peers as "grandstanding" when they won't enforce I-1639. In his view, there's not much in the initiative for sheriffs to worry about. And he's basically right — for now. Since February, Knezovich has taken a "pox-on-both-your-houses" approach to the controversial measure, asserting that the measure is both "unconstitutional" and doesn't give sheriffs anything to enforce, meaning that sheriffs saying that they won't enforce it are just posturing for constituents who largely oppose the measure. "I can't enforce something that I have no authority to enforce. There's nothing in this law for a sheriff to enforce," Knezovich said at a Feb. 1 press conference. "I have problems with my peers stepping up and saying 'I'm not going to enforce I-1639'," he went on to say. "Well, that's empty words. I-1639 doesn't give a sheriff anything to enforce." Broadly, yes. Only one portion of the measure is currently in effect, and the rest of the laws don't kick in until July 1. This means that the vast majority of the expansive gun control initiative isn't actually on the books yet, and therefore, isn't enforceable at this time. So, Knezovich is arguably right on that front. However, some argue that the portion of I-1639 that is active — which is the new requirement that purchasers of semi-automatic rifles be at least 21 — does fall under the jurisdiction of sheriffs and local level law enforcement for enforcement. Dusty Breen, special services chief at the Lewis County Sheriff’s Office, says that I-1639 does fall under the "purview of the sheriff's office" and that they will enforce it. This doesn't mean that his office is conducting routine inspections of gun dealers in the county to make sure that they're following the new minimum purchasing age requirement. (The Federal Bureau of Alcohol, Tobacco, Firearms, and Explosives is the agency that conducts state Liquor and Cannabis Board-esque routine site inspections of gun dealers.) Rather, Breen says his office will conduct investigations into any reported cases of gun vendors in their county violating the new minimum age rule. They would then forward their findings to the county prosecutor's office for potential criminal charges. "If an incident happens and that requires investigation, we're not going to turn a blind eye," Breen says. "If something gets reported to us then we'll look into it." He says that it's not common for them to receive reports of repeated, willful violations of state law by gun vendors, meaning that prosecutors don't always decide to press charges: "Sometimes it's an education piece and sometimes it's an enforcement piece." "It's not something that we deal with on a regular basis," Breen adds, referring to situations where dealers are chronically violating state law. But there is data to suggest that gun dealers don't always follow the law, meaning that enforcement at the local level is relevant. A 2013 U.S. Justice Department review of Federal Bureau of Alcohol, Tobacco, Firearms, and Explosives (ATF) inspections of federally licensed gun dealers found that, in 2011, almost 40 percent were out of compliance with federal law. State elected leaders concur that local and state-level law enforcement are responsible for enforcing I-1639's new minimum purchasing age. In a letter issued on March 7, Washington Attorney General Bob Ferguson and Gov. Jay Inslee called on gun dealers to abide by the new age requirement for purchasing semi-automatic rifles, warning them that violations of I-1639 "could be investigated by either local law enforcement or Washington State Patrol," and that "such an investigation could lead to criminal charges." Previously, Sheriff Knezovich has told the Inlander that Washington State Patrol should investigate any cases of gun vendors violating the new minimum purchasing age requirement, and has reiterated his position that the law doesn't involve sheriffs. "Washington State Patrol can investigate it. Since it's a state law it's a state investigation," he said on Feb. 18. "There is nothing for a sheriff to enforce in this." "If there is a violation we will deal with it," he says. Cap. Monica Alexander, head of government relations for the Washington State Patrol, tells the Inlander that their agency typically defers reports of gun vendors violating state law to local law enforcement agencies, such as county sheriffs. (Last month, Jeff Sevigney, a spokesperson for the State Patrol, also said that they would "defer" cases of gun vendor violations of state law to "local jurisdictions.") She adds that local law enforcement can ask that State Patrol to investigate a case, but those requests need to be approved by the agency's chief. "That is our interpretation," Alexander says, adding that proactively investigating gun dealers for breaking state gun laws is "not what we normally do." Breen says that ATF would typically end up getting looped into any local investigations into dealers suspected of violating state law, given that federal regulations require that licensed dealers follow both state and federal law. However, ATF would focus on investigating any violations of federal law, deferring the state regulations to local law enforcement. "If we learn that a federal firearms licensee — such as a gun store, sporting goods store, pawn shop — is breaking federal and state law then we would be the lead agency for the federal violation," Jason Chudy, a spokesperson for ATF, writes in an email to the Inlander. "The applicable state/county/local law enforcement agency would handle any state law violations." Knezovich also tells the Inlander that his office would only learn of gun vendors violating I-1639's new age requirement if the state Department of Licensing — the agency that technically holds the state-level licenses for firearms dealers — informed him. "The only way I'm going to find out is if DOL lets me know," he says. However, DOL staff maintain that local jurisdictions are responsible for enforcing state-level gun laws and that they only get notified of gun vendors breaking state law from local agencies. "We don't have an enforcement component to our firearms program," says Christine Anthony, a DOL spokesperson.